2. COOK and stir chicken in large nonstick skillet on medium heat 6 to 7 min. or until lightly browned. Add vegetables and Cooking Creme; cook and stir 1 to 2 min. or until heated through. 3. TRANSFER to 9-inch pie plate sprayed with cooking spray. Cover with crust; seal to edge of pie plate with fork. Cut several slits in crust. Place on baking sheet. 4. BAKE 30 min. or until golden brown. 5. TIP: Prepare using a rotisserie chicken purchased from the supermarket. Remove chicken from bones, then chop or shred it. 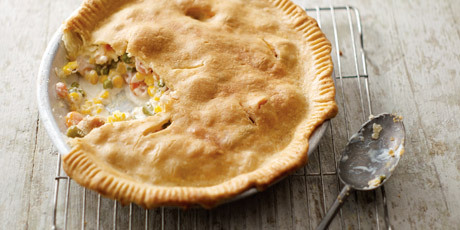 Combine 3 cups chicken, vegetables and Cooking Creme in nonstick skillet; cook and stir until heated through; spoon into pie plate, then continue as directed. Refrigerate remaining rotisserie chicken for another use. When baking at home, follow Anna Olson’s step-by-step methods to creating beautiful and delicious cakes dressed to impress. What better cocktail for your party season? than a classic Manhattan – easy to make and you’ve probably got all the ingredients in your liquor cabinet already.